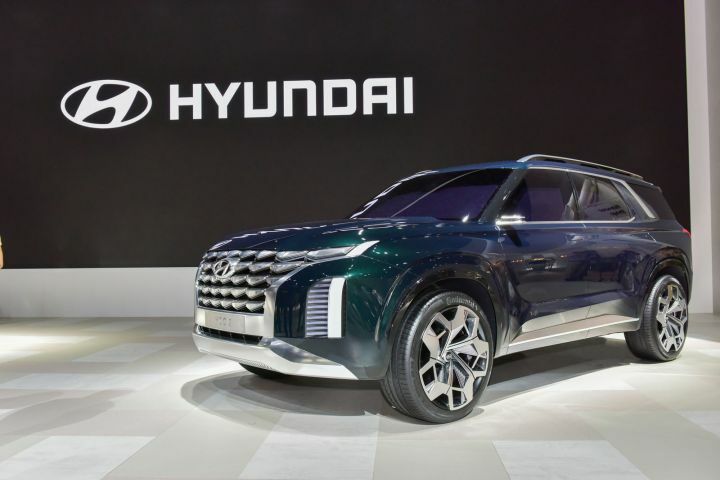 Hyundai’s first ever full-size luxury SUV to seat eight. The Palisade to be positioned above the Santa Fe as new flagship. Might feature a 3.3-litre V6 with 290PS. Global reveal at the 2018 LA Motor Show. Sales likely to commence mid-2019 in the US. Hyundai is readying its first ever full size SUV, called the Palisade, and thanks to some recent spy images that have surfaced online, we now know what it looks like. The first ever undisguised images of the massive eight-seater from Hyundai are out ahead of the official reveal at the Los Angeles Motor Show on November 28. A production follow-up to the Hyundai Grandmaster concept, and built on the same platform as the upcoming Kia Telluride, the Palisade will offer seating for eight along with all-wheel-drive capability. Hyundai is pitching the Palisade as a full-blown luxury SUV, and it will take the flagship space above the much smaller Santa Fe globally. In terms of looks, what’s striking is the sheer size of the Palisade. It is massive and just like its key rivals like the Ford Expedition and the Chevrolet Tahoe in the US, it’s likely to get chunky tyres, acres of space and a large panoramic sunroof. The Palisade has been designed under Hyundai’s new, eccentrically labelled “Sensuous Sportiness” design strategy, under which all future Hyundai SUVs and sedans will be designed. From the front, the Palisade looks pretty identical to the Grandmaster concept, featuring a similar yet more subtle octagonal grille framed by thick chrome strips. This is accompanied by tall headlights that stretch to the surface of the front fenders. The vertical running lights are accompanied by LED DRL eyebrows sitting high much closer to the bonnet and give the front facia a sleek appeal. We will have a better idea on the rear design once the SUV is officially revealed in LA; however, it might feature similar-looking vertical tail lamps and tailgate from the Kia Telluride. Under the hood, Hyundai is likely to offer a 3.3-litre V6 producing 290PS paired with an automatic transmission. When Kia introduced the Kia Telluride concept it had a 3.5-litre V6 engine paired with an electric motor to produce 400PS. Hyundai has been pretty tightlipped on the engine specs but some reports also suggest that the Palisade could also feature a twin-turbocharged version of the 3.3-litre engine, which produces 365PS. Global media will see the Palisade for the first time at the LA Auto Show and it will be available in the US from mid-2019 as a 2020 model. We would love to see this fullyloaded SUV come to India, however there is no official word on this for now. Do stay tuned for more updates and the complete coverage on Hyundai’s behemoth SUV in the coming days.